More than 400 people gathered Thursday evening to view the stars over Sand Beach at Acadia as part of the Acadia Night Sky Festival in Bar Harbor in 2016. For homesteaders far from urban centers, one of the best parts of having property in the countryside is the ability to see stars at night. If you have trouble seeing the stars, though, light pollution may be to blame. Even if you aren’t a constellation spotter or a planet-chaser, the light produced on your property affects how you experience nature — and often the impact that you have on it. In layman’s terms, artificial lights glares into our eyes and illuminates the night sky making it hard or impossible to see things like stars and galaxies. Light pollution compromises the view of the night sky, which in Maine are some of the most pristine in the Eastern United States. 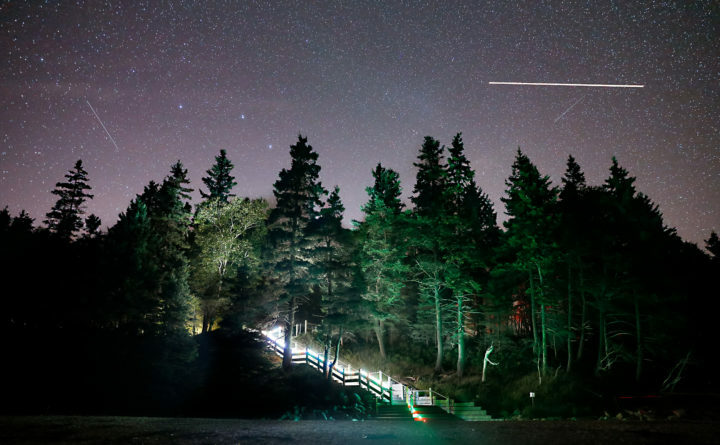 “I think Maine is one of the has one of the most visited dark skies east of the Mississippi River, especially in the mountains by the Bar Harbor area,” Elissa Chesler, a member of the organizing committee of the Acadia Night Sky Festival, said. “There are large dark sky reserves in the Western United States but most of the Eastern United States is very developed. It certainly is an important issue in tourism.” Chesler estimates that the Acadia Night Sky Festival, which has taken place annually since 2009, draws more than 5,000 visitors to the area every year. Encourage your lawmakers to adopt a lighting ordinance to promote dark sky-friendly light habits in your community (the International Dark Sky Association released a Model Lighting Ordinance in 2011 as a guideline). According the Chesler, Bar Harbor’s lighting ordinances was one of the factors that led to the inception of the Acadia Night Sky Festival in 2009.